You know those personal ads you find on posting classifieds websites like Kijiji and Craigslist? You can find such posts as "Single elderly man looking for witty female companion for (fill in the blank)". Some are considerably more risqué, some are downright comical, and occasionally you come across a sweet one. "I saw you outside the movie theatre on Main St. at 10pm. You were wearing a green scarf. Our eyes met and I’ve been thinking about you ever since. Contact me at...". One organization, I Wish I Said Hello, is working to bring back the missing connection between people in Manhattan. The organization finds these postings on classified personals listing and creates custom stickers with quotes from the actual posting and some images. They then stick the sticker in the exact spot where the "missed connection" took place. Missed connections, according to Wikipedia, is an occurrence where two or more people are unable to exchange information or the information that is exchanged is lost, preventing further connections. Poetic and disappointing. 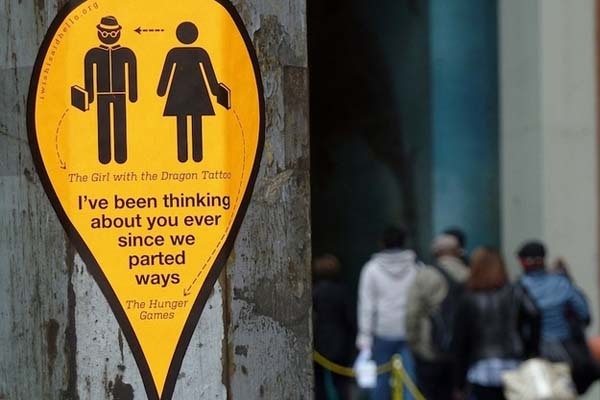 I Wish I Said Hello is attempting to bring missed connection stories back to public space in the form of street art and sticker bombing. The intention is not to bring people back together, though this would be rather romantic, but to celebrate poetics and romantics as well as the physical mapping of a digital network and the role of technology in human communication. The vinyl stickers, while taking some original content from actual postings in personals, follow a universal style which was derived from public signage and are placed in highly visible locations. I Wish I Said Hello hopes collaborators and citizens will join their movement and begin to spread the idea through other cities as well.